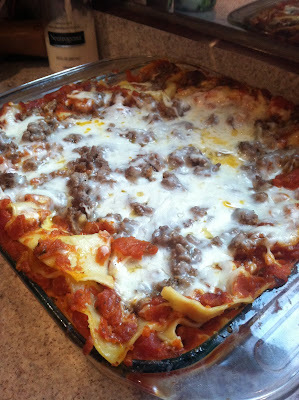 Yesterday I decided I was going to make lasagna. Today, Ed decided he wanted to do it. He wanted me to show him what to do, but not to actually help. I agreed, but secretly thought I'd have an aneurism because I'm such a control freak and didn't think I'd be able to get through watching him through the entire process. What if he didn't spread the ricotta correctly? What if he didn't sprinkle on enough mozzarella? What if he didn't alternate the pasta on each layer? I've seen him cook before. And I don't like the way he stirs. But he felt he could handle it, so I had to sit back and just instruct. Here he is finishing up the first pan - we made three pans so we'd have it to eat for meals this week. I have to say, it was amazingly delicious. We'll use the big pan for tonight's meal and the next few days until it's gone, and I'll cut and wrap individual pieces from the other two pans and freeze them for another time. The kitchen comes in so handy. Last night I made stir-fry with the two porterhouse steaks I had in the freezer. We bought fresh red and green bell peppers, onion, mushrooms and snow peas, I added a can of water chestnuts, and tossed it all in a tasty stir fry sauce. Deeeelish! I'm very excited that Ed made dinner (and lunch, and lunch, and lunch) for us. I still got stuck doing the dishes, but that's a small task compared to all the prep and cooking he had to do. I'm going to kick back and watch some tube now. Ahhhh, this is the life. You do more cooking in that truck kitchen than many of the young gals I know do. Looks delish. Wish I was there to enjoy it. Many people who work with busy schedules end up snacking on unhealthy sweets or sodium-packed junk food. This is usually because healthy meals require a lot of planning Meal Delivery Experts —something that can be hard to do if you don’t have much time.